BRUSSELS, Belgium -- Nine months after its change of government led Ukraine toward closer ties with Moscow, a large question looms over the first set-piece meeting here on Monday between President Viktor F. Yanukovich and European Union leaders. 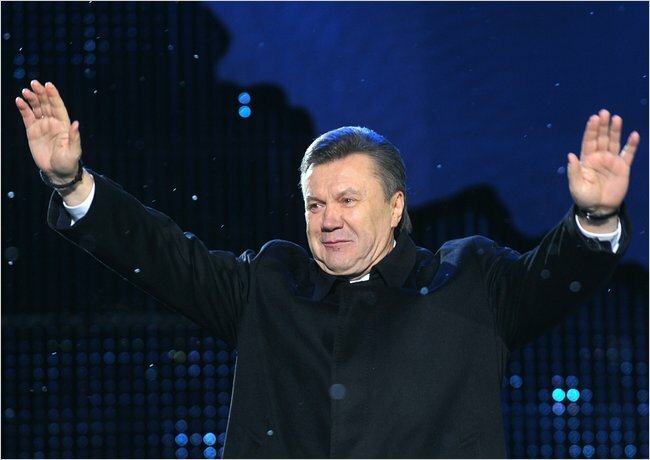 President Viktor F. Yanukovich will meet with European Union leaders on Monday. Will Ukraine have to choose between Europe and Russia? When he came to power in February, Mr. Yanukovich struck a deal with Moscow on the transit of natural gas supplies and extended the lease of Russia’s Black Sea naval base, calming Russian fears that Ukraine would seek quick membership in NATO. Since then, Moscow’s relations with some E.U. nations, particularly Poland, have improved. On Monday, for the first time, a meeting between the European Union, Ukraine and Russia on energy is also scheduled in Brussels, buoying hopes for a cooperative, triangular relationship. Ukraine, with about 46 million people and independent since the collapse of the Soviet Union almost two decades ago, borders four E.U. countries and is a vital energy corridor. Yet the country’s volatile politics, its complex relations with Moscow, and the consequent crises over the transit of natural gas to other parts of Europe have made Ukraine an awkward partner for the European Union. Too important to ignore but too difficult to bring quickly into the European fold, Ukraine poses a unique challenge for Europe’s leaders. On Monday, in the Château de Val Duchesse, they will emphasize concerns over deteriorating human rights while seeking to encourage reforms, according to E.U. officials. By discussing energy projects, the easing of visa regulations and a potential free trade agreement, they hope to draw Ukraine slowly westward. But the European Union has not offered Ukraine any commitment on a path to membership in the bloc. In European capitals, support for any further expansion of the European Union is dwindling. What’s more, Ukraine is big, relatively poor, and burdened by problems. Hit hard by the financial crisis, Kiev accepted billions of dollars from the International Monetary Fund. The lack of transparency in its energy sector discourages Western investors. Five years ago, Ukraine’s prospects all looked different when the Orange Revolution led to the presidency of Viktor A. Yushchenko, who promoted his country’s membership in NATO and the European Union. But his triumph disintegrated as a result of political in-fighting and, with the change of power this year, the rapprochement with Moscow began. “The stabilization of relations between Ukraine and Russia is only for the good, also for relations between the E.U. and Ukraine,” Konstantin Yelisieiev, Kiev’s ambassador to the European Union, said last week at a briefing in Brussels. Ukraine’s European aspirations, he added, are “unchanged.” In Brussels, Ukrainian officials have courted journalists to assert that Kiev has not retreated into a Russian sphere of influence. Dmitri Trenin, director of the Carnegie Moscow Center, contends that Russia has little to offer Ukraine. Russia’s concerns about the last Ukrainian government centered on its NATO ambitions. “Any kind of integration that doesn’t include that very serious security component is in principle O.K.” Mr. Trenin said. According to E.U. officials, José Manuel Barroso, the president of the European Commission, has this year had more meetings and telephone calls with Mr. Yanukovich than with any leader outside the 27 member nations of the European Union. The European Union is Ukraine’s main commercial partner, accounting for around 30 percent of Ukrainian external trade. That could increase, officials say, if a free trade area can be negotiated. Adopting E.U. standards and working toward a trade agreement with the European Union, which is the world’s largest trading bloc, appears to be a better option than aligning with Russia’s customs union with Kazakhstan and Belarus, membership of which is probably incompatible with Ukraine’s membership in the World Trade Organization. A trade accord with the European Union would mean meeting higher commercial standards for Ukraine but does not preclude trading with Russia. Thomas Gomart, director of the Russia Center at the French Institute for International Relations, said Mr. Yanuvovich’s room for maneuvering was restricted. Experience suggests that nations make domestic reforms a priority only once they believe they have a good chance of joining the European Union. This suggests that there are limits to Ukraine’s integration with the European Union, just as there are to its rapprochement with Moscow.